OFFICE No. 6 NORTH POTOMAC ST., HAGERSTOWN, MD. AND OSAGE ROLLER FLOURING MILLS. Hair, Calcined Plaster, Salt, &c.
Shippers of Mill Feed and Pure “FULCASTER” Seed Wheat. 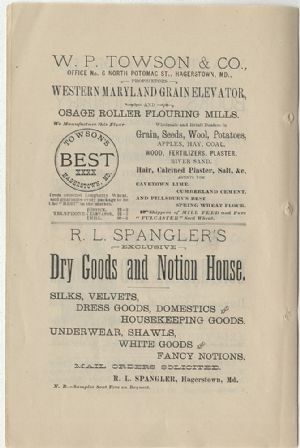 SILKS, VELVETS, DRESS GOODS, DOMESTICS and HOUSEKEEPING GOODS. UNDERWEAR, SHAWLS, WHITE GOODS and FANCY NOTIONS.